I couldn’t drive to my local comic shop fast enough this week. Today, I’m going to review the fifth issue of The Fall and Rise of Captain Atom. This is a six-issue limited series that has been my favorite thing DC Comics has produced so far during Rebirth. I have always loved the character of Captain Atom. Mainly, because of the way he looks he and his powers. They always fascinated me and I loved watching him on the Justice League cartoon. Earlier this year, I wrote a series about heroes that need to be in the DCEU. Captain Atom was one of those heroes. I’ll link that piece at the end of this one. In that piece, I mainly referenced Captain Atom’s New 52 run. It was really my first time reading about the character. Overall, a solid comic that was written very well and the art by Freddie Williams, especially in the first few issues, made Captain Atom look the best he ever has. In this story, I learned about what makes Captain Atom a true hero. I learned about the tragedy of his life and I empathized with him. This new series picks up where the New 52 left off, but it’s a perfect starting point for new readers. Not only does it reinforce the themes of his N52 run, but this story has been bulletproof. Government corruption, a broken family, and new villains. This series has expanded on the mythos of Captain Atom and I love that. Before I get into this issue however, we should probably recap. So, you know that bright blue skin Captain Atom, aka Nathaniel Adam, has had for years now? Yeah, it’s a thing of the past. This story is about Captain Atom shedding his old powers and identity for something new. Except he didn’t want anything new. All he’s ever wanted was a normal life. In the first issue, we learn that Captain Atom has been experiencing quantum flare ups. These flare ups are the equivalent to a human being sick. 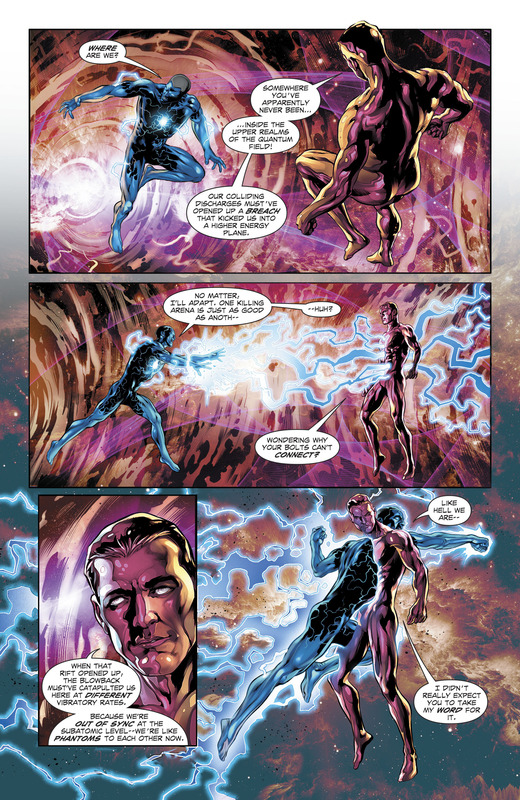 Captain Atom’s body is releasing massive amounts of quantum energy because his atoms are constantly splitting. The constant splitting of his atoms are the source of his powers, but they make him dangerous. Anyways, during one of his flare ups, where the Justice League attempts to help him, Atom kills three people in a town in Kansas. This drives him insane and he attempts to kill himself. Except the overload of his powers didn’t kill him. Instead, he’s sent back in time to the year 1994. Here, Nathaniel is able to have a good life. He has a wife, a job, and she eventually gets pregnant. The time stream corrects itself though and Nathaniel is forced back into the present. He comes back with new powers and the ability to change between human and quantum hero. Throughout this story, General Eiling, a corrupt military man, has been attempting to use Captain Atom as a government pawn. At first, our hero declines, but upon learning that Eiling has been covering up the fact he has a son, Nathaniel decides to play along so he can try to find his son. In the last issue, he revealed himself to the world as the second Captain Atom. The story is that he was an engineer working at the facility the first Captain Atom was at when the meltdown started. The blast gave him his powers and the rest is history. Now the people admire him again and he can start a new life. When Captain Atom goes to a jail to carry out a mission, he accidentally gives powers to an inmate who was supposed to be executed years ago. The inmate overpowers him and escapes. The last issue ended with Dr. Megala, the doctor responsible for Captain Atom in the first place, watching Atom’s son with a camera he has inside the child’s bedroom. Every good hero has a villain. Batman and Joker. Superman and Lex Luthor. Spider-Man and Green Goblin. Sometimes, if a hero is lucky, they have an entire rouges gallery to fight. Captain Atom hasn’t been afforded such luxuries. He’s mainly been a side character and his stories have involved his powers and/or people’s fear of them. The villain he has now is an escaped convict he gave powers to. His name is Max Thrane. This issue starts off with some exposition about what happened last issue. The public has knowledge of the fight that’s happened between Thrane and Captain Atom. We see a worker for General Eiling talking to Eiling about ways to spin the story. Eiling decides to spin it so this is once again blamed on the first Captain Atom. As long as they continue to see him in a bad light, it allows the new Atom to come in and clean up. Nathaniel is standing there the entire time they’re talking. He storms out of the complex, frustrated with Eiling. I love this opening because while Captain Atom knows he needs to stop his new villain, codename Ultramax, he wants to take care of his responsibilities as a parent by going to see his son. It only enhances his character. While Nathaniel is out playing dad, this issue focuses on the villain. I have a big gripe with this issue, but it isn’t necessarily related to the story. Before that though, this issue is another solid one because of the development of the villain, Max Thrane. It isn’t Earth-shattering development, but it’s something. We see that Max Thrane is going around killing people. Yeah, surprise, right? The murderer is killing. But seriously, Thrane is searching for the person who sold him out to the Feds. Thrane was a professional hit man. His clients ranged from mobsters to CEOs. His first target was a mobster who was seconds from being murdered by another boss. Thrane saves his former client temporarily and asks the mobster who sold him out. Of course, it wasn’t the mobster, oh so he says. Thrane proceeds to kill him. I have to give another shout out to artist Will Conrad for his work on this issue. Thrane is menacing. He’s thin, but fit and the energy constantly glowing around him makes him look amazing. The next person he pays a visit to is a pharmaceutical CEO. Thrane helped this woman kill her husband so she could take over the company. She says she didn’t sell him out either and he kills her. This time, instead of using his powers, he throws her from her building. The last person that we see him visit is a rapper. This is where my problem with this issue is. You know, I don’t know if writer Cary Bates and co=plotter Greg Weisman are white, and I don’t care. This comic has been sensational and I will always love the character of Captain Atom. But, adhering to stereotypes is a major problem in comics. It’s a major problem with a lot of writers who aren’t minorities. The rapper Thrane goes to see is named DZee. Really? I know there are some ridiculous names in rap music (Lil Uzi Vert and Lil Yachty to name two) but there a plenty of rappers who have normal sounding stage names. Logic, Travis Scott, Kyle, Fabolous, Drake, J. Cole, Kendrick Lamar, Kevin Gates, Kanye West, Black, Rick Ross, you getting the picture? Too often, rappers in fictional stories are painted as extravagant characters out of an late 80’s wrestling promo. It’s infuriating. Not only that, the reason Thrane was associated with this rapper is an out dated stereotype. Thrane killed DZee’s West Coast rival, Big Sir (these names are something of literary genius, right?) West Coast rival? Yes, some rappers engage in behavior like this. Or they want to at least. But, for the last ten years or so, the whole coast war thing between rap artists has almost completely faded away. I’m not expecting for Cary Bates and Greg Weisman to understand or care about the current culture of rap music, but these stereotypes are lazy. Either lightly brush over it, but make it still feel authentic, or do a little research. So, Thrane kills DZee and the issue transitions to Nathaniel with his son. Nathaniel got to his son, Genji, by being the representative from the ROTC program. Genji had expressed interest in joining the military. Nathaniel takes him to an air base and tells him all about the perks of the military. During this, he can’t get over the fact this is his actual son. A cool bonding moment happens next. Nathaniel takes Genji on a ride in a F-16 fighter jet. It’s an awesome moment because Nathaniel deserves happiness. That happiness was short lived though, when Genji and Nathaniel have lunch after the ride. Nathaniel casually mentioned the absence of Genji’s father. Genji gives us an insight we haven’t seen yet during this story. He tells Nathaniel about the disdain he has for his father. We learn that his mom, Takara Soto, ripped up every picture of Nathaniel so obviously, Genji doesn’t know what he looks like. He mentions that his mom never got over his father leaving. Genji remembers his mother fondly, but he said he always felt the sadness in his mother. Genji tells Nathaniel that he doesn’t care about his father now though. The last thing he says is, “He’ll always be dead to me.” That hurts Nathaniel. As always, this character can’t be happy for too long. Nathaniel comes to the sorrowful conclusion that this is a lost cause. In order for him to have a real relationship with Genji, he’ll have to come clean about everything. Usually, the “come clean about everything” scenarios are blown out of proportion. This one though, is almost impossible to believe, even as a human in a world where Superman and Green Lantern exist. As Genji leaves, Nathaniel notices a flash of light from a building across the street. He quickly transforms and realizes that a crew of people were spying on them the entire time. He’s furious. The issue transitions to General Eiling receiving the news. Nathaniel confronts him soon after. Before they can talk though, Ultramax storms in. The reason Ultramax is there isn’t clear, but Captain Atom steps in to stop him. This was the best part of the issue. They have a history and have similar powers. This makes for an interesting fight. The two of them come to blows and are instantly teleported out of Eiling’s house. Artist Will Conrad draws a beautiful page here. Thrane is confused as to where they are, but Captain Atom graciously explains for him, and us. He tells Thrane that their combining energies sent them into the upper level of the quantum field. Ultramax doesn’t give a damn. He tries to blast Atom with energy but the blasts phase through him. Once again, Captain Atom must educate us. I love this moment because it shows that Captain Atom isn’t an idiot. He isn’t a genius either, but he decided to learn about his powers and their effects when he first got them. Captain Atom’s powers are amazing too. I love seeing how they work and seeing all of the cool things he can do. He’s one of the most powerful beings in the DC Universe. Atom explains that blowback sent them to the quantum field at different rates. So they’re basically phantoms to each other. Captain Atom though, is an expert at traveling through the quantum field as a phantom. He’s figured out the right amount of energy needed to tell the difference between the frequencies. He blasts Ultramax out of the quantum field and back to Earth. An awesome moment. Atom returns and is greeted by Eiling. The issue ends with Ultramax in his house. He’s talking to himself and the last page shows him looking at pictures on the wall. The pictures are of all his recent clients who he’s suspected of selling him out. The last picture on the wall is of General Eiling. What an ending. Issue number one and two are my favorite in this series. Three and four were great set up issues and this one, was the perfect pre-conclusion issue. General Eiling’s actions are coming to light. Ever since the New 52, Eiling has been sticking his nose where it doesn’t belong. Was he somehow involved in the death of Takara Soto? Everything is going to come to a head in the final issue of this miniseries. I’ve loved every issue of it and am not looking forward to the end of this series. Captain Atom has been put through so much the past few years. I want him to come clean to his son, put away Ultramax, and see General Eiling get his commupence. From there, the Captain Atom story can be expanded more in the future. Despite the lazy stereotypes in this issue, it was just as good as everything else. There’s a lot riding on this last issue for me. I’m going to be more critical than usual because this story deserves a proper ending. Buy this comic before the last issue comes out. If you’re into crazy science and typical DC characters who are more heroic than anything else, this is the story for you. Captain Atom is the hero for you. Hopefully, he gets the ending he deserves. I hope you enjoyed this review. Next, I’m planning on continuing with my “Why I Love” series. The series focuses on nothing but positive things I love in comics. The first thing I talked about were the new Green Lanterns, Simon Baz and Jessica Cruz. The next hero in my series is Daredevil! Make sure to follow me on Twitter @Hero_Review for more updates. Until next time! !